● Haiti Relief Now ! As we send aid to Haiti we must look closely at the way our country and organizations are doing so. We have to insist that aid is sent in the form of grants rather than loans. Haiti is a country that has been abused and controlled by debt, and we must make sure that relief efforts now will not later be used to further tyrannize and impoverish the people of Haiti. Definitely keep giving and keep encouraging others to give, but insist that it's not used in the form of debt. Because, unfortunately, (as documented in Naomi Klein's The Shock Doctrine) the US has a history of using disasters to push through tyrannical policies, both here and abroad. ALL PROCEEDS WILL GO TO HAITI DISASTER RELIEF. 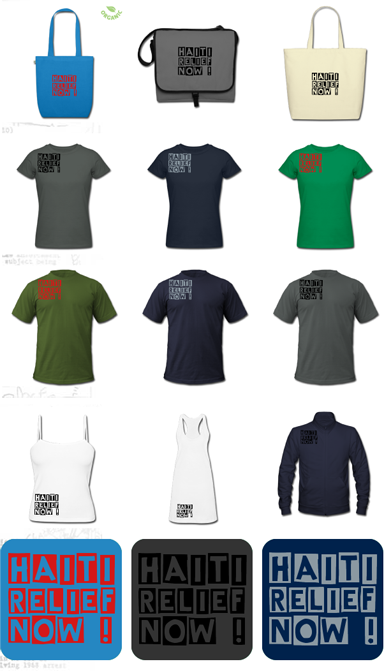 Help Haiti by Buying a T-Shirt, Bag, Dress, or Jacket.